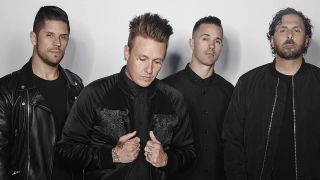 Papa Roach have 12 tracks ready to go for their next studio album, according to frontman Jacoby Shaddix. The band posted pictures across social media in July which suggested they were already working on the follow-up to Crooked Teeth – despite the fact it only came out in May 2017. And in a new interview, Shaddix has shed more light on the album which will once again be helmed by Nicholas Furlong and Colin Brittain. Shaddix tells Rock Sound: “We did work with the same producers that did Crooked Teeth, so this is the follow-up to it and it just feels great. “We played a bunch of tracks for our friends in Beartooth and some other folks, and everybody was feeling it. It's exciting to play new music for people – it felt good. Unless they're totally bullshitting us. And if that's the case, they are great bullshitters." Asked about the quick turnaround in the writing process, Shaddix adds: “We have a rhythm going with these guys. We were supposed to go on tour with Of Mice And Men at the beginning of the Crooked Teeth cycle – and former vocalist Austin Carlile got really sick, so the tour was canceled. “We were, like, ‘If we're not going to be out on the road, let's go create.' So we went in and created five or six songs. Then we went back in June and July and took another stab at it. We have 12 songs – there's bangers in there. Shaddix continues: “We're going to go back and do one more track and see if we can beat one of the songs and we'll have a full-length record ready to go. So either later this year or early next year for a release." Papa Roach have several 2018 tour dates remaining throughout October and into November.